Healthy Tomato Juice .If you have to spend some twelve thousand rupiah to enjoy a glass of juice you buy outside the home than if you make their own juice at home. You can make juice for tens of thousands of rupiah, but with a much larger portion. And most important of course juice you make at home is much more healthy and maintained clean. This time we gave the juice recipes are very easy and cheap. Therefore, the main ingredient is tomato juice. The tomato fruit are easy to find, and at an affordable price. But the tomato has many essential nutrients that can not be underestimated. The content of the most famous tomatoes is lycopene benefits. Lycopene is a powerful antioxidant which tomatoes have it in considerable amounts. That's why eating tomatoes regularly can keep you healthy and avoid some type of serious diseases, such as cancer, heart disease, and stroke. In addition to lycopene, tomatoes are also essential nutrients obtained from the content of vitamin C, alpha lipoic acid, and choline. Let's start right now we rutinkan eating tomatoes. But first need to be considered for those who have the disease in the stomach (eg gastritis), because tomatoes contain acid that can aggravate the symptoms of the disease. Similarly, for those who have kidney disorders and heart disease, should avoid this one fruit. But for healthy people, it is very good tomatoes to be consumed regularly. And there is one thing you should consider before eating tomatoes, ie wash with clean running water. Because the tomato is one of the fruits were exposed to pesticides in considerable numbers, it is sure that the pesticide has been lost while you eat. Well, now let's try tomato juice recipes below. 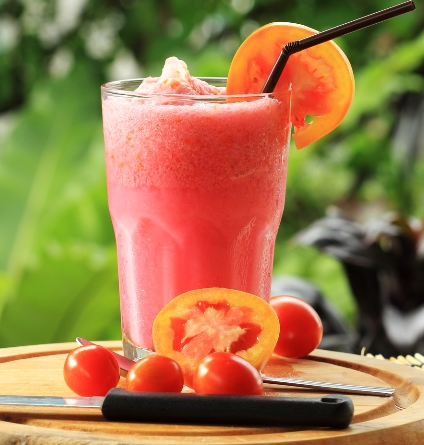 0 Komentar Untuk "Healthy Tomato Juice"